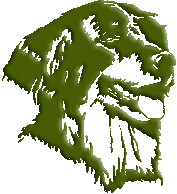 I have been breeding Hovawarts under the name Kieferhof's since 1999. 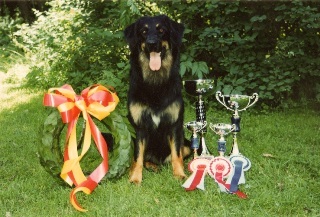 My first Hovawart, Zenya came to us in february 1997. When Zenya came to us I was hoping to get to use her for breeding. Because she had healthy hips and elbows, looked like a Hovie, and also was mentally stable, I applied for a kennel name. I had already passed the basic course for breeders a couple of years earlier. My surname is Furu (Swedish name for pine tree) and our house is surrounded by pine trees. Because of this I wanted a kennel name that would be suited for this. 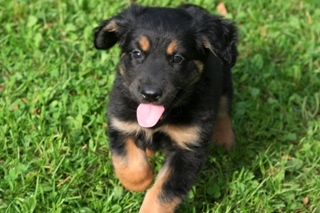 Kiefer and hof are German for pine tree and estate, respectively, and Hovawart is an old German breed originally used as an estate guard dog - hence the name Kieferhof. 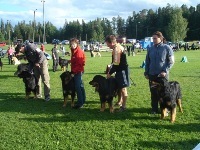 Kieferhofs Showy Axim, "Aksu" came best in show in Tromsø, Norway (judge was Elke Peper, Germany). Aksu lives with Anne and Ilpo Orava in Piikkiö. About the show on NKK's web page. Kieferhof's came 3rd in the breeders' class. 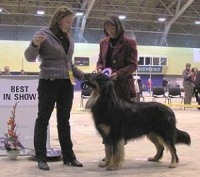 Kieferhof's came 2nd in the breeders' class. 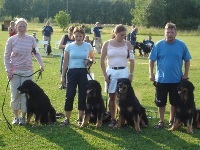 Kieferhof's won the breeders' class.